It was PGE’s biggest power outage event since the December 2006 storm and it took over 3 days to get the last few customers back online. That said, most customers were back within 24 hours due to those hard-working crews. 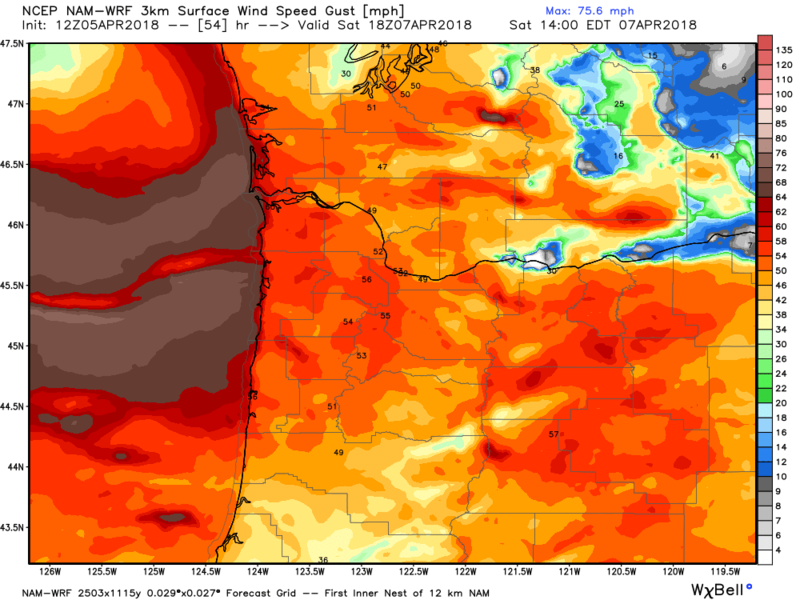 So of course it’s VERY interesting that we have another wind “event” coming up exactly one year later…Saturday April 7th. Luckily, this one does not appear as strong, but will likely cause some inconvenience for many of us during the daylight hours Saturday. 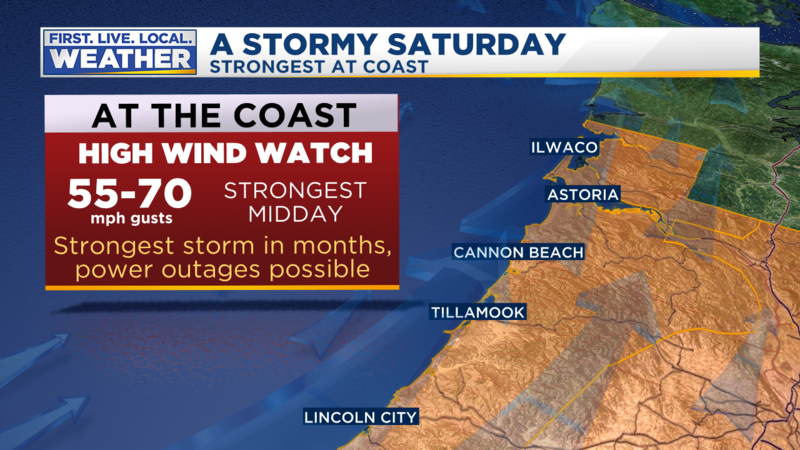 Just like all of our wind storms/events, a deep surface low pressure center will be tracking up the coastline Friday night and Saturday morning. It ends up around 972-980 millibars depth somewhere around central/southern Vancouver Island Saturday afternoon. Note the 2pm location from the WRF-GFS model. Also see the tight packing of isobars, indicating large pressure change over relatively short distance. The tightest packing is generally associated with the strongest wind as air rushes from high to low pressure. Looks windy on the coast! and the ECMWF, although it’s a bit weaker. The National Weather Service has issued a High Wind Watch for the western valleys, the only one of this entire “storm season”! That’s due to an abundance of caution even though it’s unlikely we see widespread gusts above the 58 mph criteria required for a High Wind Warning. Remember it’s a WATCH, not a WARNING. The NWS may upgrade to a warning tomorrow or convert to a Wind Advisory…we’ll see. When comparing current models to last year’s storm, they are all a bit weaker, by maybe 10 mph. That plus the low placement/depth leads me to believe that instead of 45-60 mph gusts in the valleys (last year) it’ll be more like 40-55mph for the vast majority of us. Coastal wind gusts were “weak” last year; the main action was inland. We’ll see how that plays out this year. In the springtime the strong upper-level winds mix down easily in the “warm” valleys so we can get as windy as the Coast. 42 mph is the peak southerly wind gust we’ve seen in the past 6 months. Very weak. That means it’ll be relatively easy to topple a few trees here and there. 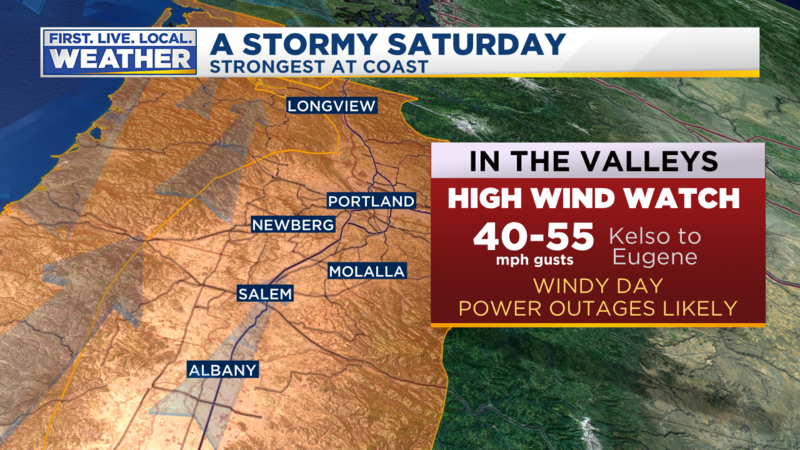 Expect plenty of power outages, even if we only see gusts 40-45 mph. We have a bunch of wind coming up this weekend, not a MAJOR storm, but pretty darn windy for April! This entry was posted on Thursday, April 5th, 2018 at 5:20 pm and is filed under Weather. You can follow any responses to this entry through the RSS 2.0 feed. Both comments and pings are currently closed. NWS on board for tomorrow! Apparently Mr. Nelsen is as well. Fun times (or not) ahead! 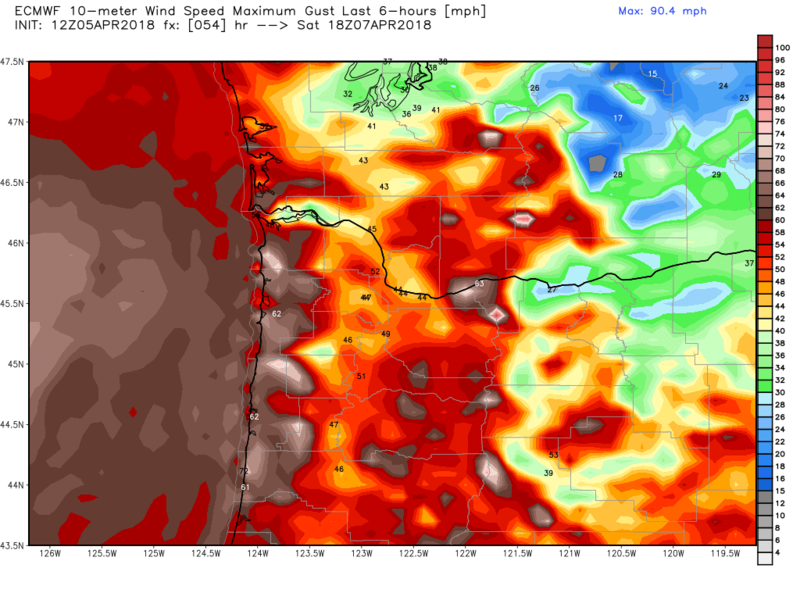 According to Rod Hill, his models (I think he uses a mixture) forecasts 37 to 40 mph sustained winds for the Willamette Valley. Mark’s forecast seems on point. Have you looked at the link this morning? I just realized something on it. If you look at the ledger on the bottom right, if you click on it, it will change. Right now I think it’s on kt but if you keep clicking on it, it will change over to mph. The ECMWF seems to have stronger wind. At least it looks like it to me. Morning! I had actually thought the EURO was a tad weaker. But I guess not! The track seems to be south according to the ensembles. Now I’m probably going to focus on the HRRR and HRRRX models because I’ve heard they are good for close range forecasting. Yeah, we have to wait a little longer of the full HRRR. But from what I can see the low is developing on that more south, which is good for us. Oh absolutely. But for weather geeks,this is a thrill indeed. 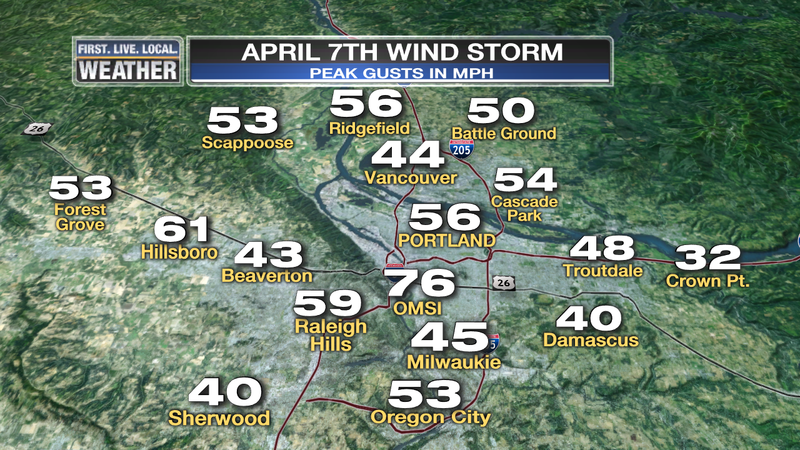 Amazing, that we will have 40-55 gusts exactly a year after another strong windstorm, in April nonetheless! Wow. Are ensemble runs very important? Because all three are trending south, especially GEFS, which has landfall on Olympic Peninsula. What you need to look at is the ensemble mean. It looks at all the ensembles (from one model run to another) and gives you an approximation on what the low will do. I sent you a link on another comment that I think you will like. Let me know if you found it. Thank you for the link! I’m looking now, and I think that Mark’s forecast right now seems spot on at 40-55 gusts. I’ll be looking at the satellite imagery like crazy tomorrow. It’s gonna be a fun day! The one thing I have noticed on the 00Z NAM is the low races up to Central Vancouver Island then stalls for a couple of hours then takes a right turn and goes into the Puget Sound. I don’t think I ever seen that before. Very interesting. What does that do for us? I’m not really sure. It’s just really weird. I think it will change in the next few runs. I hope this will work. I’m not sure if you have this website. When you click on the link, you will see in the bottom left corner a button to hit play. Right now it is set on the ECMWF (EURO) but you can see the NAM and the GFS models. I’m hoping it set so you can see the whole state of Washington and Oregon. It looks really cool 🙂 I don’t think I can do a hyper link so you’ll need to copy and paste it into a new tab, sorry. NAM has decreased winds a very slight bit, expect it to bounce back. GFS and EURO both trending south. Nice blast from the past! I remember that song was really catchy. My first first! Not that it matters. I do think this storm will be very interesting. I’m excited. That’s good. His comments were very rude and inflammatory, and in the past I have seen him make similar comments. Well, now the attention can be on the weather! I totally agree with you. I love the weather and would rather talk about that than having to deal with someone who is being rude. 0.31 inches of rain here and a light drizzle. The GFS is behaving odd, backing off and then increasing gusts. I wonder which model seems the best right now? Anyways, I think 40+ gusts for Saturday seems like a sure bet. Oh, did F40 A$$holeface get the boot? I did forget to mention what Mark asked me to do and I would like to ask for everyone on this blog to do. If that person comes back under a different name (I’m assuming people will know it’s him/her because they will be rude) then let me know so I can contact Mark again and have them removed again.